Whether you are hanging around the library or not, college-style is something to try this season. Forget about dull polo shirts and checked skirts and blend some school-girl sweetness with edgy street style. Take a hint from Alexa Chung, Olivia Palermo and Gossip Girl’s Blair Waldorf and match girly classics with current trends. Inspire yourself with numerous bloggers and pull out a bag from granny’s closet or acardi from a vintage store. Put on a classy pleated skirt in a deep navy blue or try a different approach and over your tights wear a pair of shorts. Remember about details: frills, lace and bows are more than welcome. Opt for more rock chic? Choose leather, either in classic black or in khaki and brown shades. For a perfect match, slip on a delicate chiffon or silk blouse in bright pastel colors from creamy pink to sophisticated turquoise. Must-have color this upcoming season: mustard yellow. Get a romantic look by sporting a subtle long sleeve dress with embellished collar. During colder days, keep yourself warm in a cozy button-up cardigan or fitted blazer. Good accessorizing is the key to success. Put on a pair of camel oxfords or some crazy-printed, colorful heels. 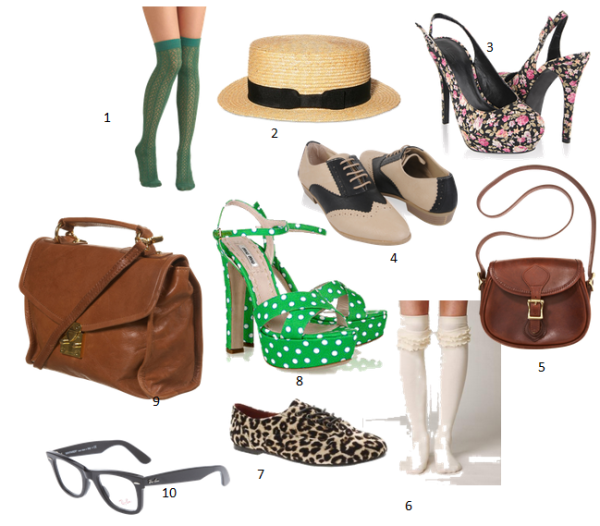 Don’t forget about fancy tights or over-the-knee socks and a caramel leather bag. Top it up with a retro straw hat and you are ready to hit the campus.